A man accused of possessing an al-Qaeda training manual has appeared in court. Khalid Khaliq, 34, faces three counts of possessing a document or a record likely to be useful in terrorism. 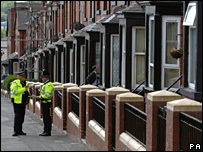 A CD-Rom containing an al-Qaeda training manual was allegedly found in a raid on his home in Tempest Road, Beeston, Leeds. Mr Khaliq, a father-of-three, appeared at the Old Bailey on Friday and was released on bail. The case was adjourned until 16 November. Mr Khaliq is accused of possessing the manual on 17 July 2005. Two other books, Zard-e-Mujahid (Essential Provision Of The Mujahid) and The Absent Obligation, were also said to have been found in May 2007. The possession of such a document - containing information likely to be useful to a person committing or preparing an act of terrorism - carries a maximum 10-year jail sentence.